It’s time for bitcoin traders to batten down the hatches. The notoriously volatile cryptocurrency, whose 150 percent surge this year has captivated everyone from Wall Street bankers to Chinese grandmothers, could be headed for one of its most turbulent stretches yet. Blame the bitcoin civil war. After two years of largely behind-the-scenes bickering, rival factions of computer whizzes who play key roles in bitcoin’s upkeep are poised to adopt two competing software updates at the end of the month. That has raised the possibility that bitcoin will split in two, an unprecedented event that would send shockwaves through the $41 billion market. While both sides have big incentives to reach a consensus, bitcoin’s lack of a central authority has made compromise difficult. Even professional traders who’ve followed the dispute’s twists and turns aren’t sure how it will all pan out. Their advice: brace for volatility and be ready to act fast once a clear outcome emerges. Explainer: What Is SegWit2x and What Does It Mean for Bitcoin? The plan, first proposed in May, quickly won favor among many of bitcoin's startups and mining pools. Yet, it has also emerged as contentious in some quarters, owing to its specific goals and technical construction. But, what's at the heart of the arguments for and against? 1. It would enact the long-proposed code optimization Segregated Witness (SegWit), which alters how some data is stored on the network. 2. It would set a timeline for increasing the network's block size to 2MB, up from 1MB today, to be triggered about three months after the SegWit activation. 1. Bitcoin is currently limited in the number of transactions it can process. Today, it can only process up to 1MB of transactions roughly every 10 minutes. 2. Owing to this limit, transactions take longer to approve during times of heavy use. 3. As all users pay a fee to miners to make transactions, this limitation on space has increased average fee costs. 4. Increasing the block size makes network nodes more costly, as node operators must store the entire copy of the blockchain as computer files. While the article and associated chart are factually accurate, the chart and main title of the piece are ultimately a bit misleading. * For starters, the chart that they decided to use only goes from $210 to $245. This is a remarkably small monetary value. Second, the chart only spans one day. All of this serves to make the dip look significant. bull becomes bear. Crypto market crashing. Digital currency bitcoin on Friday averted a split into two currencies after its network supported an upgrade to its software that would enhance its ability to process an increasing number of transactions. BIP 91 is the first step toward a larger effort to upgrade bitcoin through a software called SegWit2x. On Friday, the support for BIP 91 reached nearly 100 percent, exceeding the required threshold of 80 percent, according to analysts and market participants. On Monday, Russian airline S7 began using a blockchain platform for their ticket sales. The move is evidence of both Russia's interest in the technology and a worldwide shift toward a future supported by blockchain. Russian magazine Kommersant has reported that the airline S7 began selling tickets using an Ethereum blockchain on Monday. The country’s largest private financial institution, Alfa-Bank, is supporting the move, which was made to simplify payments and decrease settlement times between airlines and agents — a process that usually takes two weeks. The decision may have been made to get ahead of another Russian airline, Aeroflot, which recently released a request for proposals on how to incorporate cryptocurrencies into their own services. 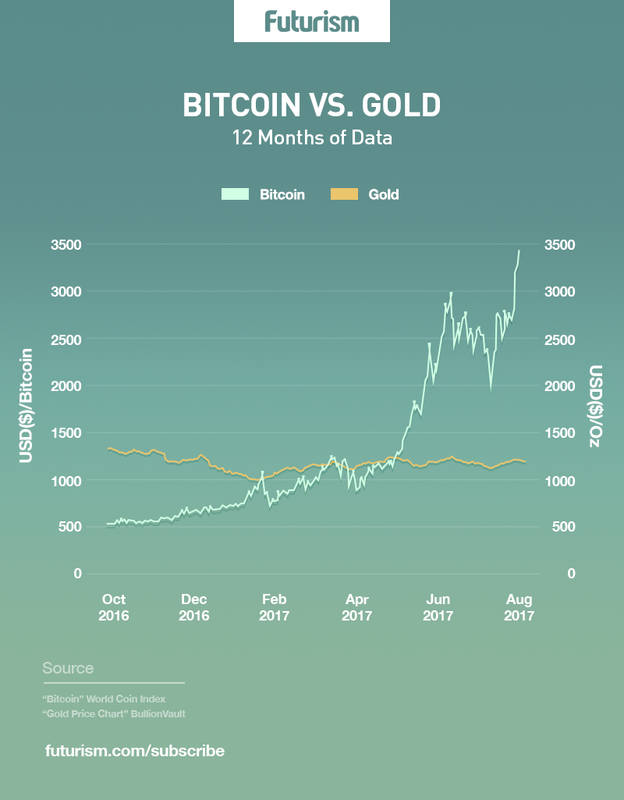 After a weekend of significant gains, Bitcoin has continued that trend by being worth nearly three times the price of gold. Gold is often seen as an investment “safe-haven” due to the long term stability of the commodity. It is also often used as a standard by which to compare cryptocurrency, especially Bitcoin. 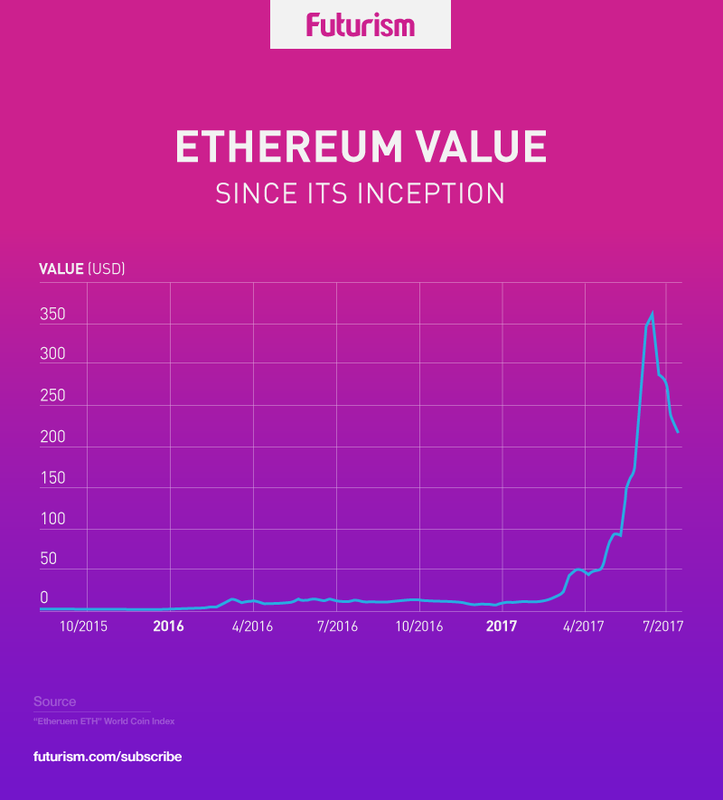 Many of the leading cryptocurrency’s major milestones have been viewed in terms of their comparison to gold. The latest numbers are truly staggering. The price of Bitcoin reached a high today of over $3,400 (at the time of writing it stands at a similarly impressive $3,390.66), while the price of an ounce of gold is $1,260.40. This leaves Bitcoin at nearly triple the price of gold, renewing speculations about the ability of Bitcoin to become a substitute for gold. The digital currency bitcoin vaulted to a new record high above $4000 on Saturday, boosted by strong Japanese demand on its way to multiplying its value fourfold this year. Bitcoin traded as high as $4,000.93, more than 7 percent higher near $3,941 in Saturday dealings, according to CoinDesk. The digital currency has now quadrupled in 2017, and is up about 40 percent in August alone. Bitcoin's market value is now around $64 billion, up about $10 billion in the last week. Bitcoin trade in Japanese yen accounted for nearly 46 percent of global trade volume, up from about a third a day ago, according to CryptoCompare. US-dollar bitcoin trade accounted for about 25 percent, according to CryptoCompare. Bitcoin trade in Chinese yuan and South Korean won accounted for about 12 percent each. For those who got in early: congratulations, you bastards. No. These currencies of the crypt will not disappear. They are about to become far more popular. For Man desires freedom, and the banks, to Man, have long since become a tyranny. Watch for it soon... they will raise in value manifold. Estonia has proposed to launch its own state-backed cryptocurrency, called "estcoin". Ethereum founder Vitalik Buterin apparently gave feedback on the digital currency. It would be launched via the digital coin community's version of crowdfunding - an initial coin offering (ICO). Jamie Dimon has dropped bitcoin again, warning govt will close it down if it gets too big. Bit of joke, too late, the cat is already out of the bag. Russian central bank now condemning cryptos. I think 2018 is going to be the most interesting year in the global financial system. Crypto may have the most illegitimate birth of any currency out there, but does that even matter? THIS MAKES NO SENSE! GOLD IS VALUED BY WEIGHT! BITCOIN IS WEIGHTLESS! You have to pick a weight of gold to compare with 1 bitcoin, so you can always have picked a weight, such that bitcoin is worth three times the price of gold. You can also pick a weight today, that makes bitcoin half the price of gold. Hong Kong is looking into building a trade-financing system using blockchain technology, a senior official said. Blockchain, the decentralized encryption technology behind cryptocurrencies, could provide “great benefits” to trade finance in countries participating in China’s Belt and Road initiative, said James Henry Lau, Hong Kong’s Secretary for Financial Services and the Treasury, at a forum Friday. Blockchain works by automatically recording transactions in inerasable digital ledgers distributed across a network in which all data is visible to every member of the network and transactions don’t require a central authority’s approval. This technology could cut the huge input of human resources and time that trade financing traditionally requires, reduce chances of fraud and lower companies’ investment costs through more efficient settlements, according to Lau. What do you guys think of cryptocurrencies/blockchain possibly being hacked as quantum computers come online? New bitcoin is created by computers solving complex cryptographic problems, a process known as "mining." PowerCompare.co.uk says the amount of electricity used by computers mining bitcoin so far this year eclipses the annual usage of countries like Ireland and most African countries. Bitcoin's electricity usage is coming under increasing scrutiny. What interests me more is the possibility of using quantum computers to create an entirely new sort of cryptocurrency. Perhaps the ultimate cryptocurrency, one that cannot be hacked but also can't be mined by conventional computers. This would essentially limit the currency's holders to only those with access to quantum computers and potentially be the "true" starting point for central banks to take cryptocurrency (and quantum computing) seriously.